Wow, so bright and cool and summery! I just love the bright green and watermelon red, and the contrast with the black. This card makes me feel cooler just looking at it! Cute sentiment! 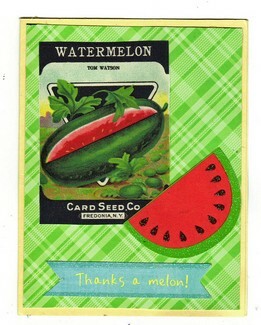 "My seed pack card uses a watermelon Lunagirl image. The green mat, sentiment, and watermelon embellishment are leftovers from a SEI pack." And isn't watermelon appropriate for this picnic / cookout weekend? Hope everybody here in the States has a great Labor Day weekend. So cool on such a hot day here!